Fresh dressed and frozen turkeys, fresh dressed and frozen chickens, and fresh eggs. 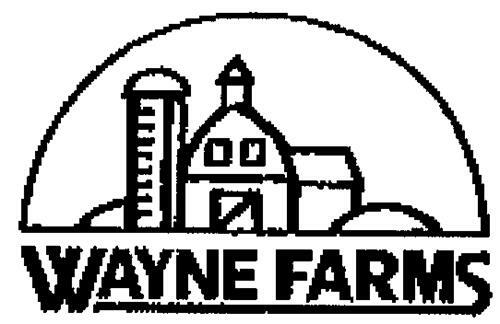 On Monday, July 21, 2003, a canadian trademark registration was filed for the above pictured logo by WAYNE FARMS LLC 4110 Continental Drive, Oakwood, Georgia 30566, UNITED STATES . The Canadian IP office has given the trademark application number of 1185028. The current status of this trademark filing is Registration published. The correspondent listed for is MARKS & CLERK of 100 Simcoe Street, Suite 200, TORONTO, ONTARIO, CANADA M5H3G2 The trademark is filed in the description of Fresh dressed and frozen turkeys, fresh dressed and frozen chickens, and fresh eggs. .
(1) - Fresh dressed and frozen turkeys, fresh dressed and frozen chickens, and fresh eggs.